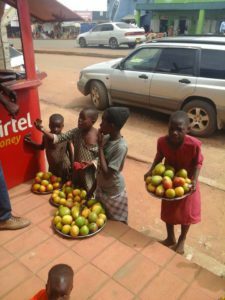 As government fights to implement the Universal Primary Education (UPE) and Universal Secondary Education (USE) programmes children of school-going age in the eastern district of Iganga are busy vending mangoes and maize during school hours. When our reporter visited the district today morning children as young as seven years could be seen with buckets containing mangoes while others were selling maize just next to Iganga District Police Station. But the Iganga District education officer, Mr Baker Kasadakawo, said the district authorities are working closely with police to ensure that children attend classes instead of vending mangoes. “We have instructed sub-county chiefs to liaise with police to arrest child vendors during school hours,” Mr Kasadakawo said, adding that a recent operation was carried out in Busembatya sub-county, Iganga District, in which several school-going children were arrested. He said although no charges were preferred against the child vendors, their parents were summoned to police and cautioned against engaging their children in vending, especially during school hours. Enoch Ndazura, the councillor for Iganga central division, attributed the vice to acute poverty in the area. “Parents are poor and unable to afford the basic necessities for their children. It is the reason why they send their children to look for an extra coin,” Mr Ndazura said.